The Line Item Report Builder provides a graphical editor that lets you modify the default report format to improve the report output. The following section provides a brief introductory tutorial. The subsequent section describes the main elements of the Report Builder user interface. In the following exercise, you create and modify the report layout for the data structure you defined in MyApp.MyReportDC. At the top of the Fields column, click Set source. The system displays a dialog box. Select the Data Collector you created previously, by clicking MyApp, then MyReportDC. At the top of the Fields column, click Auto-fill to create a default report. In this step, you modify the report by removing the sysID data field. In the Report Body section, select either the sysID data field, or field label. Click Edit to open the editing toolbar, and click Cut. The sysID data field disappears from the report. If you want to add a data field to the report, drag it from the Fields column. Select a component in the Report Body section. A collection of tools for formatting tables in reports appears in the Properties column. In the section labeled Borders and Dividers, select Toggle table border. It is the first selection in this section, and draws a border around the table. In the section labeled Borders and Dividers, select Toggle zebra striping in body. It is the last selection in this section, and applies zebra stripe coloration to rows in the table. Add an element to the report layout. Drag $pageNum from the Fields column and drop it in the Page Footer section. You can position this element by dragging it, or by editing values in the Size and Position section of the Properties column. Click Preview to see the effect of your modifications. Setup  Opens the Page Set-up Dialog, which you can use to set characteristics for the printed page. The Page size  Select a page size from the dropdown list. The list of available paper sizes can be configured for your system. See Customizing Paper Options. The Margins  You can set all four margins with the spinner control or by typing in the text field. Units used for margins reflect the units used to specify the paper size. The Running Headers  You can choose to omit running headers on the first page, last page, or both. Fields  lets you select a data source, and displays the available data fields. The Auto-fill button creates a default report layout. Layout  the area where you edit the report layout. The column is divided into sections that correspond to the layout sections of the report. Buttons at the top of the column provide access to graphical editing tools. Properties  lets you edit graphical properties of the report component selected in the Layout column. The next sections discuss the content and function of these columns. The fields column is empty until you select a data collector for the report with the Set source button. Once you have selected a data source, the Fields column lists the data fields you defined when you created the data collector, along with the additional fields runTime, RunBy, and $pageNum. You can drag and drop fields from the Fields column into the report layout column. When you begin to drag a field, report sections where you cannot drop it turn gray. The Auto-fill button populates the layout section with a default report layout based on the selected data source. The layout column is where much of the report layout editing takes place. The Auto-fill button in the Fields column, creates a default report layout in the layout column, which you can use as a starting point. The layout column is divided into a number of sections, and provides a variety of tools and controls. paste selection previously copied or cut. 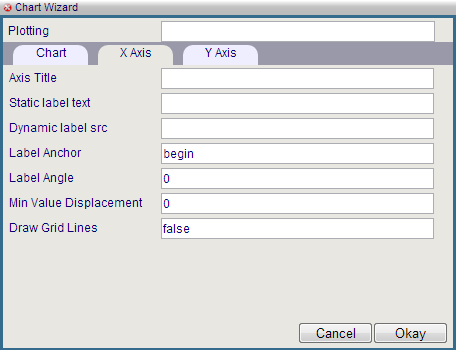 Layer  tools to control z-order of objects in the report; for example, to put text in front of a filled rectangle. Align  tools to align, distribute, and size objects with respect to other objects. The object selected first in the selection group is the standard for alignment, centering, or adjusting height or width. Objects are spaced evenly between the right- and left-most (or top- and bottom-most) objects in the selection group. Tools  tools to perform graphical editing functions like moving report elements and adding text and graphics. select an object. shift-click to select multiple objects. 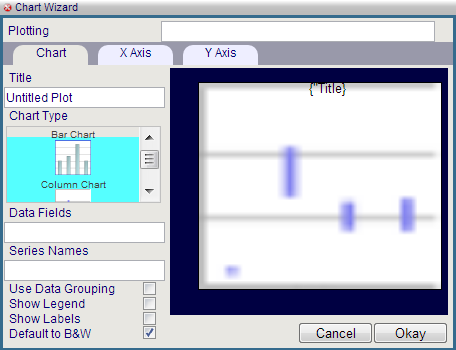 This image shows the chart configuration dialog. This image shows the dialog with the X-Axis tab active. This image shows the barcode configuration dialog. You can also type the XPATH expression directly into the text field next to the Dynamic radio button. Format  Select either Code-39 or Code-128. 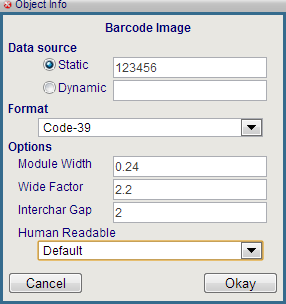 Options  Specify options for the barcode, including whether it renders the value in human-readable text. This image shows the image configuration dialog. You can specify an image by typing the URL into the text field, or by browsing for a local file. Supports graphical elements such as bar codes, images, charts, and lines. Text in long fields does not wrap. Only available when processing XSL nodes, not node sets. When used to replace the rendering of a group body, the tool automatically renders one banner layout section per record in the data stream. In essence, it renders a banner layout for what would have been a row in a table. Only available when processing XSL nodes, not node sets. When used to replace the rendering of a group body the tool automatically renders one paragraph layout section per record in the data stream. In essence, it renders a paragraph layout for what would have been a row in a table. Only available when processing XSL nodes, not node sets. When used to replace the rendering of a group body, the tool automatically renders one name-value pair layout per record. In essence, it renders a name-value pair layout for what would have been a row in a table. Add or remove a page break at the end of the section. A line that looks like this: indicates a page break. Add a conditional sub-section or running header. Delete the section and its contents. You can restore the section by clicking on the gray bar, but the restored section is empty. Fill Style: Lets you specify fill color and opacity. These options are also available for Line Style and Text Style. Opens a color picker from which you can select the fill color. The same icon is used to select color for lines and text. Move the slider to select the opacity, from 100% (far right) to 0% (far left). The same icon is used to select opacity for lines and text. Line Style: In addition to color and opacity, the Line Style group also lets you set the following properties. Lets you select the line width. Lets you select the line style. Text Style: In addition to color and opacity, the Text Style group also lets you set set the following properties. Lets you select bold, italic, or underlined text. Each button in this control toggles, and you can select more than one. Lets you select the font size by either typing into the field, or using the spinner control. Lets you select the paragraph justification. Lets you select the font family by using the spinner control. Toggles the border surrounding the table. Toggles the border surrounding the table header. Toggles the divider between table header and the table body. Toggles the dividers between header columns. Toggles the dividers between body columns. Toggles the dividers between body rows. Toggles zebra striping in the table body. Opens a color picker that lets you select the alternate color for zebra striping.